Life as the only daughter of a world famous magician-illusionist father and a mother who was a powerful sorceress of the Homo Magi race could hardly be called mundane. From the time Zatanna was born she was immersed in magic. Sadly, for her, her mother "died" in childbirth - or so she was told by her father. She grew up never knowing the woman from whom her innate, genetic magic wielding abilities were inherited though her father told her constantly about her mother and did the best he could to keep Sindella's memory alive for their daughter. From the time Zatanna learned to talk, she learned to develop magic casting abilities as her father performed them and absorbed everything he taught her. It wasn't long until he began to use his 'lovely assistants' in his shows less and began to include his daughter more. By the time she was 12 she was as much a draw to her father's shows as he was due to her magical and illusionary prowess. They traveled the world together and Zatanna came to find in her father a trusted teacher, friend and confidant. Even as she traveled with her father under the guise of performing magic and illusion shows, she knew he also offered advice and aid to others who traveled within the same arcane and occult circles. It was through one of these encounters that her father disappeared. He encountered an evil elementalist named Allura who cast a curse upon him and banished him to an unknown dimension and reality with a momentary flare of power even the Spectre could not contain. None of his peers could locate him and many believed h&e was actually dead. Stricken with grief, Zatanna chose to honor her father's legacy by continuing with the world wide Zatara Shows of Magic and Illusion. It was the only thing she knew; her entire childhood was made up of magic and illusion. She certainly didn't need the money - her father's estate was vast and his collection of rare or irreplaceable books and tomes of arcane, occult and ancient knowledge was unlike any other in the world and beyond priceless. After completing her father's tour obligations, she did something she had never seen her father do in her lifetime. She took a break from performing. She needed to find herself, her identity as a young woman and as a magician. It wasn't until she did this, staying home and reading her father's journals and notes and looked deeply into her family history that she truly came to realize how blessed she was and from what a prestigious lineage she came. As the Spectre neared the decision to lift his Judgment, Zatanna found more than just her father's memoirs and thoughts within his library. She found he possessed the journals of other historical greats who were her direct ancestors. Leonardo da Vinci, Nostradamus, Alessandro Cagliostro, Nicolas Flamel, Evan Fulcanelli and even King Arion of Atlantis (through her mother) were in her family tree. Through her reading of their knowledge and experiences, she realized that her father's methods of casting magic - memorizing spells and incantations - was not the best method for herself. She realized that she was not so much memorizing as she was, somehow, drawing upon an inner power, a bond with magic itself that allowed her to simply create the desired result. When the Judgment was lifted, it was as if a dam was broken. Her ties to magic were fully established and raw, uncontrolled power rippled through her with wildly unpredictable and dangerous results. She immediately went into seclusion to try and figure out what was happening and how to properly wield her power. She delved deeper into her mother's past this time, learning everything she could and realizing that she was not simply a magician but a sorceress. She had inherited the Homo Magi gene from her mother and it was to this source from which her casting abilities were tied. She immediately altered her focus and began to tap into her latent powers. She learned to translate verbal spell incantations mentally and then cast the spells backwards as her foci and means of control. She had found her true potential as a sorceress and devoted herself to the investigation of the arcane and occult and she resumed touring. Magic performances were too much a part of her family heritage to just walk away completely. Additionally, she could use her travels as her father had; as a means to go around the world and study at sites of great arcane and occult significance and power. Zatanna continues to live her life as she did before she began searching for her father and before the Judgment was lifted by the Spectre. She tours with magic and illusion shows, learning and studying the arcane and occult and helping to protect the earth from all forms of mystic attacks, seeking to preserve the balance between light and dark (sometimes by aiding the darkness.). She still hopes that one day she will find her father and bring him back. The woman that is Zatanna Zatara is nothing if not complex and multi faceted when it comes to who she is and her personality. Her public persona is the show-woman and magician who performs three shows a night, each sold out and still manages a perfect smile while bringing the house down each and every time. Her more private self she shows to friends and allies, those she trusts. And there is her true self, the Zatanna that typically only her father ever saw. No one, yet, has gotten close enough to her to know who she really is 'under the top hat'. Zatanna is the consummate professional. She learned the value of a good work ethic from her father and how to properly conduct herself during business transactions and while on stage. She always seeks to maintain the decorum a situation demands and rarely loses her composure. 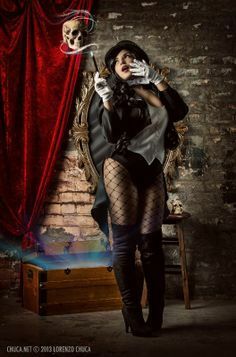 If Zatanna has learned nothing else from studying the occult and arcane, it is that one who does not follow a thought, a lead, or a line of questions to the complete and utter conclusion is a person who will regret that decision. Maybe not immediately but eventually. Failing to leave no stone unturned can be dangerous; what is omitted from an answer is as deadly as what is said. Fortunately for her, it really isn't in her to /not/ turn over every stone, to chase down every possible lead since she is trying to find her father and who can say what bit of information might prove to be the lynch pin to the whole mystery? It could also be called tenacity or purposeful. Knowing that she is a sorceress not just a magician has given her a strong thirst for knowledge and for wisdom. She wants to know everything. Okay, it could also be called an obsession. There. We've said it. Her driven nature also dovetails with being thorough, really. Because she is thorough, her drive to find her father burns powerful within her. Because she is driven to find her father, her thorough nature remains honed and acute. Because she is alone, she remains driven to become the best she can so that her father will be proud of her - when (not if) she finds him again. The very personal self within Zatanna is a girl who never knew her mother and has currently lost her father. She misses him deeply; he was her confidant, her friend. He was her family. She regrets not knowing her mother, wishing she could have so that she might know more about that side of the family, as well as know more about herself. Without either parent she struggles, sometimes. There are days she just doesn't want to be alone. It is why she has two public sides to herself. Even when she lets her guard down enough to make friends, they rarely glimpse this deep hurt at her very core. Sure, on the outside Zatanna is confident and capable and resolute. Deep within, she carries doubts with her that can be heavier on her spirit than most would imagine. What if she fails? There are moments where her confidence does fail and the power she can draw upon to cast spells will falter or possibly even fail her completely. It is rare, but it is a possible outcome. A positive, confident attitude is essential to proper spell casting after all. Zatanna is an extremely powerful magician and sorceress. Her full potential has yet to be determined but she is undoubtedly much more powerful than her father who is a powerful magician himself. To date the only true limit to Zatanna's power has been her imagination. That isn't to say that she simply goes crazy, creating anything she wants or whatever. Her father instilled a very strong sense of obligation. The whole "with great power comes greater responsibility" thing that a certain other hero's uncle had the insight to understand. Zatanna's core motivations are: to keep the memory of her parents alive. To perform stage magic at the level of her father and beyond. To know in her heart that he would be proud of her. To understand everything possible about the arcane occult and supernatural so she will be fully prepared to rescue her father when she finds the realm into which she is convinced he was banished. Get stronger and even better with her magic. Leave no stone unturned around the planet for clues. Find her father. Rescue him. Make the one responsible for taking him away from her suffer. A whole lot. Enjoy a family reunion and resume owning the magic world as the best father-daughter magic in history. The core of Zatanna's magic ability comes from a region of her brain that is unique to Homo Magi and known as the Medulla Jewel. It is an inherited genetic trait from her mother and, in Zatanna's case, her latent magical power stemming from this source has, so far, been limitless. Likely only her imagination can limit what she can accomplish through her magic. Unlike her father's magic or that of the many wizards in the world who must first study magic spells and memorize them before they can be cast, Zatanna's magic is instinctive, like notes to a professional musician. She literally weaves her spells from her imagination and creativity and manipulates them into the fabric of reality by speaking backwards incantations. She does have the ability to cast spells as her father did, by memorizing from scrolls or tomes (and transcribing them) but it is not her preferred or best method of casting. Zatanna can interact with the elements. Earth, Air, Fire and Water. She can manipulate, create, or destroy elements in any of their forms. Through elemental magic Zatanna can also control weather and plants. She can use this form of magic for elemental or even molecular control or conversion and uses it to transmute an object or living being's shape, size (increasing or decreasing) or composition (even going so far as turning lead into gold if she chose to). The power to look into other's minds using magic. She can directly access a person's thoughts, memories and personality and can remove, alter or create them (not just hypnosis, but this is part of it). She is able to communicate telepathically with others by bridging the distance with her magic. Telekinesis and levitation fall under this category of magic as well. Zatanna can conjure up dimensional portals (who needs a Mother Box and Boom Tube anyway? ), Teleportation, and can cast flight spells that allow herself and others to fly. Arcane and Occult magic is core of Zatanna's power. It includes summoning, binding, warding, divination - even extracting or the transportation of a spiritual soul from one 'vessel' to another be it organic or inorganic. She can also use incorporeal souls as offensive weapons but is often loathe to abuse a soul in this way unless she has no other alternative. She also possesses spectral sight - the sensing of magic/mystic/occult events/users, spiritual entities or the otherwise invisible to ordinary observation even from great distances. Zatanna is also capable of casting spells that alter, boost or hinder traits in herself or others physically/mentally/magically. This also includes the ability to create illusionary disguises, increase strength or endurance. - Generating force fields for protection. - The manipulation of probability in order to increase the chances of success. - Mystical warding against offensive spells cast against herself or others. - Dispelling magical attacks or spells cast toward her or others. - Regeneration spells to heal herself or others. Every magician needs a safe haven, a retreat from the dangers of the world. A place to study and research and practice new spells. Shadowcrest Manor is that place for Zatanna. Not only is it the family mansion, it is the location of her father's vast library (His library is beyond value and many (non-dangerous) and rare tomes are on constant loan to museums or universities for study) that she has now added to as well as the place she keeps the many magical artifacts and items she has acquired. It is safely warded and protected against attacks and anyone trying to break in will be in for a very dangerous and unpleasant experience even if they might do it successfully. Zatanna inherited her father's estate and fortune when he died. In addition to countless rare books and tomes worth large sums, she has the accounts and investments he made based off income from the family magic shows. Zatanna has diversified, making investments off her own performances, consulting and research assistance. She is never going to be lacking for financial security even if she never learned how to transmute lead into gold thanks to Leonardo da Vinci's personal journals. Every magician has their own set of props and equipment used for their performances. Zatanna does as well. She transports them herself, naturally. Teleportation is a wonderful thing to know. Zatanna has any number of peers within arcane, occult and religious circles that she can go to for advice on subjects or situations with which she is not experienced. Of course assistance works both directions. Not unlike a fairy who's magical abilities make them very personable and friendly, a Sorceress' innate magic affinity manifests itself as charisma. In Zatanna's case, it is amplified to such levels that very few who meet her don't like her or are not captivated by her charm and wit. She is one of those people that most can look at and instantly feel at ease around. If there were a true competitor to her level of charisma, it could only be Diana and her own divinely granted gifts. Zatanna has studied abroad as well as in her father's library (that is now her own). She has knowledge of the arcane, the occult, and many religions and has one of the world's preeminent libraries to fall back upon if she doesn't know it readily. Zatanna knows more than magic. She's more than 'just a pretty face'. She knows how to protect herself using martial arts as well as swords (or a cane in a pinch). A girl doesn't become -the- premiere magic act in the world without knowing how to put on an amazing, eye popping, jaw dropping performance. Zatanna learned from the best, her father. She's taken it farther, even making traditional routines seem new and amazing by adding signature variations to them. Zatanna understands the human psyche. She has had doctorate level training in psychology (albeit not in a college setting), and knows how to use this in tandem with her sorcery to be able to affect the minds of others as desired. This skill represents the technique and knowledge of how to use her magic skills to perform in her shows. She knows all of the methods for sleight of hand, illusions, card tricks, hypnotism, etc. Anyone that thinks speaking backwards is easy hasn't tried to do it while being attacked with fireballs or fighting off some Cthulhu like tentacle monster summoned to kill them. Zatanna has been using backwards speech as the foci for her magic for so long it really is second nature, but she still must focus on /what/ word to cast. That is another matter. Every stage magician needs to learn how to make things disappear from plain sight. Zatanna's skill in this area is among the best of the best in the business. Zatanna knows every card trick in the book and has probably invented a few of her own along the way. She knows how to deal from the bottom of the deck, shuffle with one hand, and perform complex fans and folds of cards. She is also one heck of a poker player. Zatanna doesn't -have- to speak backwards to use magic. However, she did it as a way to improve her focus and casting effectiveness. Not unlike an artist looking at a painting upside down or in the mirror to spot flaws. While it does give clarity to her spells, it is also a liability. Stop her from speaking and her spell casting is suddenly handicapped by at least seventy-five percent. Like speaking backwards, Zatanna must concentrate when casting - or reciting to cast. If her concentration is broken, she could be stopped from casting. Or worse, she could miscast a spell which means that virtually anything could happen. She might summon a fish, or she might just turn an ally into a rooted tree unable to move. This doesn't happen often because she trains to prevent it, but there are no absolute certainties with magic. With the disappearance or possible death of her father, she lost the one person she truly trusted and confided in. She doesn't often struggle with this but if she can be made to question her abilities or motives, her effectiveness can be greatly diminished. Zatanna Zatara is hardly an unknown person in the arcane and occult circles. She is a flare on a moonless night, a beacon that attracts allies and enemies alike. Further, many of them know what she can do which means they also know ways to combat her. Zatanna is a massive beacon in the arcane, occult and supernatural worlds and realms. If one would place a fresh grade A slab of prime rib in front of a pack of wolves and imagine the fight to get ahold of it, the evil spirits and demons and sorcerers of all realms might consider Zatanna no different. The daughter of the infamous John Zatara? The change to end his bloodline? Oh yes. Zatanna has many enemies she doesn't even know about let alone the long list of those she does. Zatanna has an uncontrollable fear of puppets. She does not know the cause (at this time) but it traces back to one Oscar Hampel, a puppeteer who took to robbery to supplement his income. A young Zatanna came across him during a theft and he was about to kill her when her father found them and turned Hampel into a puppet himself. Seeing her father so filled with rage was more traumatic than her near death encounter and as a result her father erased the encounter from her memories. Yet the phobia remains. Want to see the most powerful sorceress in the world curl up into a fetal ball? Throw a dozen puppets at her.